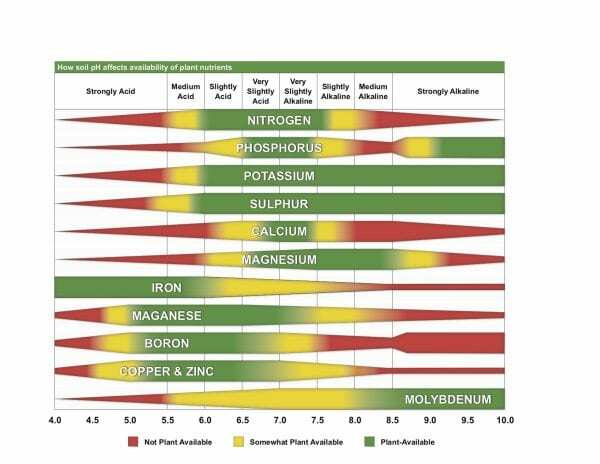 Acidic soils require lime to maintain the proper pH for growing crops and forage. Learn how to test and maintain your soil for optimal production. 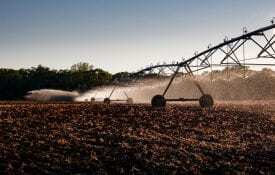 as nitrogen, phosphorous, and potassium) needed for crop and forage production begins to decrease. When pH increases above 6.5, the availability of most plant micronutrients (such as zinc, manganese, copper, and iron) tends to decrease. Maintaining pH according to soil testing laboratory recommendations will ensure that the availability of all plant nutrients is maximized and that any fertilizers applied to the soil will not go to waste. The amount of liming material needed to reach a target soil pH depends on the soil’s current pH and the soil’s buffer pH. Soil pH is a measurement of the acidity or alkalinity of a soil, while buffer pH is used to measure the soil’s resistance to change in pH. Soils that are high in organic matter and clay content have a higher buffering capacity. More lime is therefore required to raise the pH in these soils than in soils that are sandy and low in organic matter. 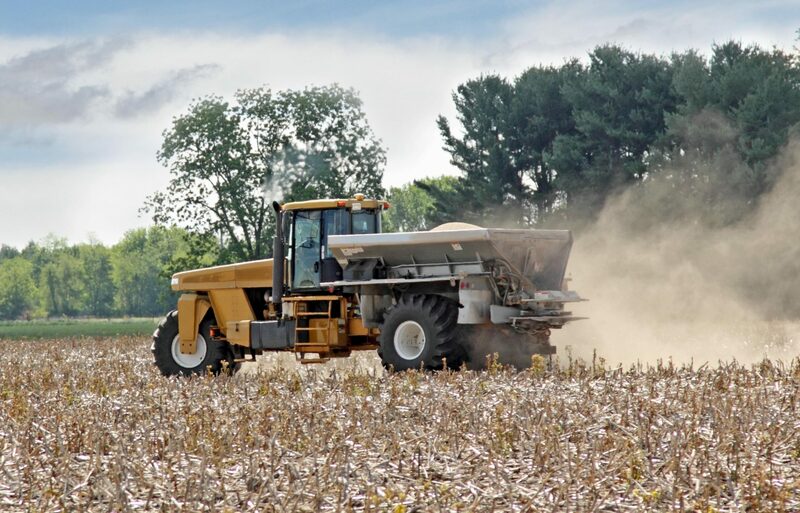 For example, a sandy soil at pH 5.0 may require only 1 ton of ground limestone to raise the pH to 6.5, while a clay soil at the same pH may require 4 tons of ground limestone. 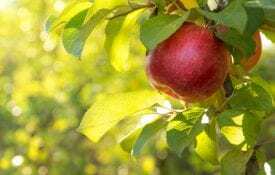 A one- unit increase in soil pH is equivalent to a tenfold increase in soil acidity; therefore, small changes in soil pH can result in different lime requirements. Soil testing labs measure both soil pH and buffer pH to make accurate lime recommendations to producers. This is the best way to accurately test how much lime needs to be applied to the soil. 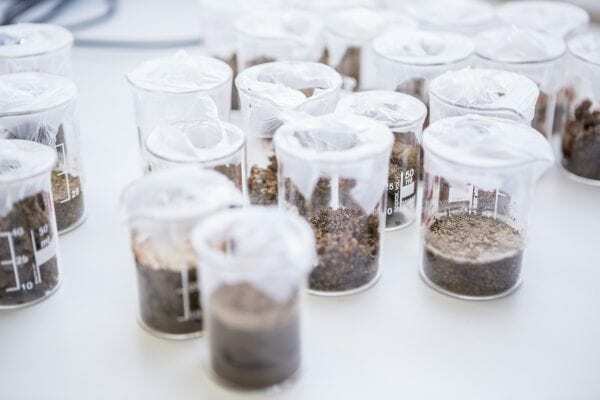 For instructions on submitting soil samples for analysis to the Auburn University Soil Testing Laboratory, go to www.aces.edu/soiltest. Not all liming materials are of equal quality. A liming material’s effectiveness is based on the calcium carbonate equivalent (a measurement of the material’s ability to change pH) and the particle size of the material. The fineness of the liming materials affects how quickly the materials react with the soil. The most common liming materials used in Alabama are ground calcitic limestone and dolomitic limestone. Other common liming materials are listed in table 1. These materials can burn actively growing foliage. ton of lime required based on soil test recommendations, approximately two tons of liquid lime are required to increase the soil pH by the same amount. The effectiveness of a liming material is typically expressed as relative neutralizing value (RNV) or effective calcium carbonate equivalent (ECCE). Contact your local Extension agent for help in determining whether a product is a liming material or a fertilizer. (OH–), or silicates (SiO4)4- to form water and insoluble aluminum minerals, thereby reducing the acidity of the soil. Neutral salts, such as calcium chloride, calcium sulfate (gypsum), and magnesium sulfate (Epsom salt), do not raise soil pH, because they do not react with Al3+ to form insoluble minerals. The material has at least a 90 percent calcium carbonate equivalent. At least 90 percent of the material passes through a 10-mesh sieve. At least 50 percent of the material passes through a 60-mesh sieve. Products that meet these requirements have a relative neutralizing value (RNV) or effective calcium carbonate equivalent (ECCE) of at least 63 percent. Therefore, producers can be guaranteed that a product is at least 63 percent effective if they buy an agricultural lime product in Alabama. the effectiveness of the product. For instructions on submitting soil samples for lime analysis to the Auburn University Soil Testing Laboratory, go to www.aces.edu/soiltest. Soil testing laboratories make varying assumptions regarding RNV when reporting lime recommendations. The Auburn University Soil Testing Laboratory assumes a liming material is 63 percent effective when making lime recommendations, since agricultural lime products in Alabama are required by law to be at least 63 percent effective. Other laboratories may assume that the liming material is 80 or 100 percent effective. Download a PDF of Choosing Effective Liming Materials, ANR-2542.